To put it simply, dental implants act as replacements for the root of your teeth. When utilized in a patient, they provide a hardy foundation in which removable or fixed replacement teeth can be put in the patient's mouth. Dental implants blend in with your natural teeth and are an excellent way to combat the problem of missing or damaged teeth; restoring aesthetics and function. Dental implants either come in singles or in groups of more than one depending on the number of missing teeth a patient has. 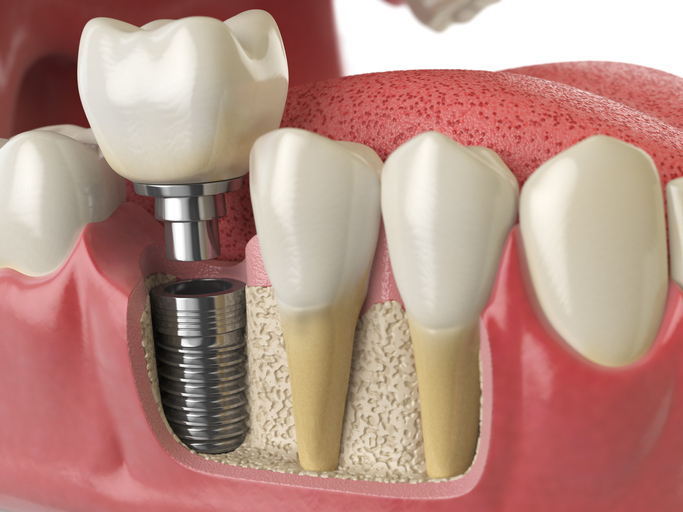 There are two different types of dental implants as well; in the bone and on the bone. In the bone is more common because it is more stable, but if there is a lack of bone in the patient's jaw, on the bone must be utilized to ensure that the dental implants remain in place. An individualized treatment is drafted up for each patient to address your unique needs. Once a plan is made, a coordinate care based approach is taken to provide you with the implant you need. The procedure is then performed; ensuring that the dental implant has taken ahold of first. The healing process can take up to three months. Once you've healed, the new teeth can be placed in your implants; giving you that new smile and mouth you've always wanted. Enhanced appearance: Your dental implants will look like your natural teeth; becoming a permanent fixture. Better Speech: Missing teeth can impede someone's ability to talk; dental implants circumvent this by restoring that function to your teeth. Durability: With excellent care, your dental implants will last you the rest of your life. Convenience: Dental implants stay in your mouth unlike dentures. They also make chewing easier than if you had missing teeth. Improved Oral Health: A dental implant does not alter any existing teeth; rather those are left intact and so your mouth can remain as natural and improve overtime with proper care. The more of your own teeth that can be left alone, the better it will be for your health since you're not replacing them with dental bridges or other materials. After receiving your dental implants, know that there might be some period in which healing and rest need to occur. However, once back to full strength, you can consider your dental implants to be the same as your natural teeth. It is very important to come up with a plan with our dentists to ensure that your post-treatment and any further treatment is handled appropriately. After the restoration for the dental implant has been completed, some level of maintenance is required in order to keep yourself infection free and clean. Just like teeth, dental implants can gather tartar and plaque. You should perform your regular at home dental routines and maintain regular professional cleanings at our office to ensure that your dental implants and teeth are being properly cared for. Dental implants are a great way to restore the function and aesthetics of a smile that is missing one or more teeth. To request an appointment for a dental implant, you can reach out to us online or by phone. Dental Excellence can help you with any questions regarding dental implants or other dentistry services offered by us if you're willing to contact us during business hours. We strive to provide quality dental implants to patients near the areas of Independence, Blue Springs, and Lees Summit, MO.